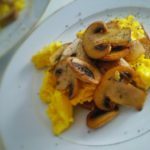 Black truffle pepper over scrambled eggs: The black truffle pepper was invented by accident when we completely forgot about what was a perfectly good truffle, left in the freezer. It had dried up so much that it looked like a nutmeg. And so, not wished to waste it, VOILA!! Black truffle pepper. If you see it anywhere else, remember you heard about it here first! And for all you chefs out there … you are very welcome! Sometimes when we travel to other countries, we lack familiar foods of home. For Americans this would be a good breakfast with eggs. While in Italy, some Americans cannot start a day with just a coffee and croissant. 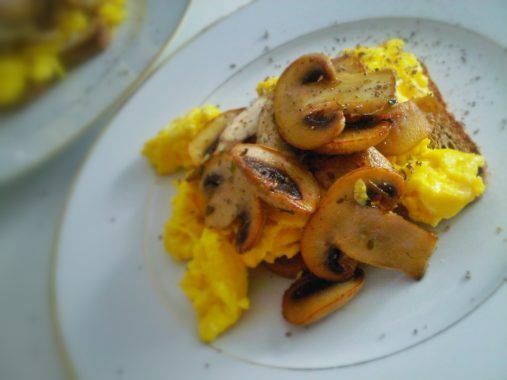 So we have combined Italy with America in a plate of scrambled eggs with a sprinkling of black truffle. For add one more thing that is American, spread the cream of Philadelphia on toast. Add 1 tablespoon of the olive oil to a frying pan with the salt. Add the sliced mushrooms and saute over a gentle heat until the mushrooms release their water. Keep them over the heat until the fluid has evaporated or been re-absorbed by the mushrooms. When the mushrooms are cooked, pour them into a dish and keep them warmed. Using the same frying pan, add the other tablespoon of olive oil and the rest of the salt. Crack the eggs into a small mixing bowl and gently beat – don’t whip. Once the frying pan has warmed, spread the oil around the pan and add the eggs. Stir the eggs around the pan to cook them through until they are only just moist. Turn the heat off under the eggs (they will continue cooking). Meanwhile cut the toast into triangles and divide the Philadelphia cream cheese between the slices. 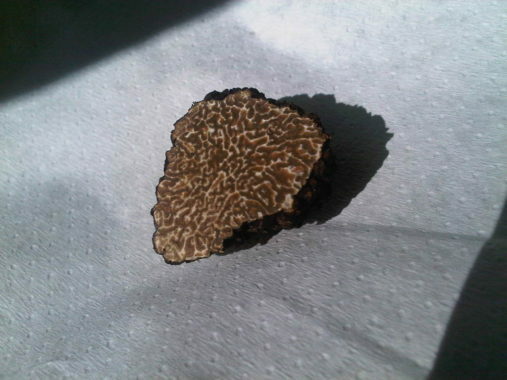 Using a small, fine grater, grate the black truffle over the top.